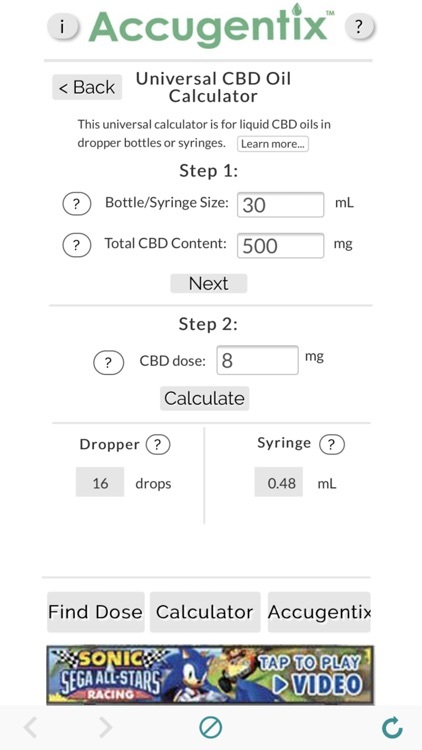 The CBD Hemp Oil Calculator App helps you find your dose and convert it into drops for a dropper and mL for a syringe. This calculator can be used for any brand or bottle of liquid CBD hemp oil. This is for current CBD hemp oil users or for beginners. 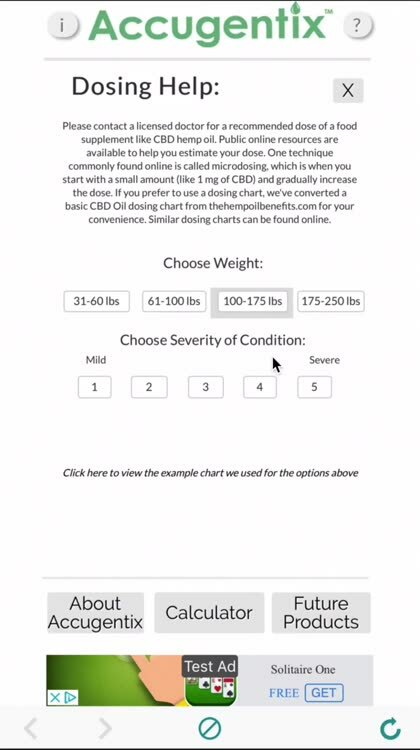 If you are a beginner, this app will help you through the entire process of figuring out how many milligrams of CBD to take while also helping you measure your oil using a dropper or syringe. There are "?" buttons next to each step to help guide you through the calculator, so if you ever get confused on a step use the "?" buttons. First, press "Find Dose" to find your dose. Then press the "Calculator" button. With the "Calculator" it guides you to input your bottle/syringe information and dose to find the number of drops/mL. The "Calculator" can be used for any brand or bottle of liquid CBD hemp oil. For your convenience, we pre-inputed information for a few popular brands (more coming soon). We are not affiliated with these brands. We obtained the information from their websites (linked on each page). 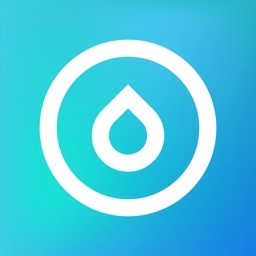 For the pre-inputed brands, all you have to do is choose the type of bottle you own, input your dose, and the calculator guides you to find how many drops and/or mL to take. Where do we get the numbers from? We use basic concentration conversions to convert the total size of the bottle and total milligrams of CBD into the corresponding drops and milliliters. We use the assumption that 1 mL equals 30 drops (which is average for most CBD hemp oil bottle droppers). 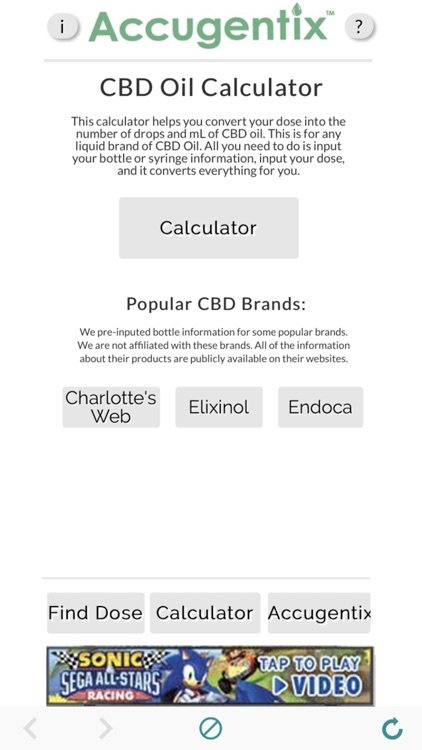 For the pre-inputed brand information, we found the bottle size and total CBD values from their public websites (which are linked on each page). This is a web app, so it requires internet/WIFI connection to function. This app is NOT for: Solid/thick CBD oil, CBD vape liquid, CBD in clicker syringes, or Rick Simpson oil (RSO). This calculator will not be accurate for these items. The numbers you input are not saved and are not tracked. The information you input is refreshed every time you open the app. Accugentix LLC does not track your personal data. This app will provide you with average values and it is not guaranteed to be accurate for your specific brand or bottle of CBD hemp oil. 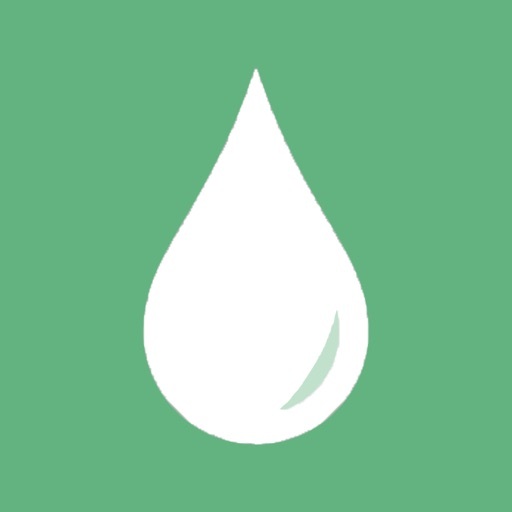 Drops cannot be accurately measured since it depends on how quickly and hard you squeeze the dropper, which is why we use average values. It is impossible for you to use 0.5 or 1.5 of a drop, so the drops are rounded to whole numbers for your convenience. Accugentix LLC owns the Accugentix Logo, Accugentix website, Accugentix product images, and Accugentix material. We do not own and are not affiliated with any of the other brands, photos, or websites shown in this app. All of the sources are linked on each page. Before using a food supplement like CBD hemp oil, it is recommended that you talk to a licensed physician. It is also advised that you talk to your physician about dosing CBD Hemp Oil. FDA Disclaimer: The statements in this app have not been evaluated by the Food and Drug Administration (FDA). The information within this app and the products associated with this app are not intended to diagnose, treat, cure, or prevent any disease.